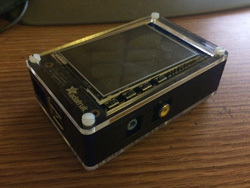 A display device connected via VGA, HDMI or RCA composite video. I started with a Raspberry Pi Model B, a powered USB hub, a mouse, keyboard, an LCD monitor, a Concept2 PM3 monitor and an A-B USB cable. For the software, I also use a library called PyRow written by Sam Gambrell where he took the time to create a Python script which along with a Concept2 specific dictionary enables interfacing with the Concept2 Performance monitor easily, and access lots of variables to play around with to really make a unique application. Finally I've also used PyGame which runs very well on the operating system and enables creation of game environments and handles graphics and controls making the whole thing interactive. Go to the Projects page to check out all the programs created so far. Even if you are new to the Raspberry Pi go to the How To page for a step by step guide on setting up all correct libraries and environments to run a RasPiRowing project.